TVs with gestural control are nothing new, but a South Korean startup is using set-top 3D motion sensors to control not only on-screen content but connected appliances in the smart home. 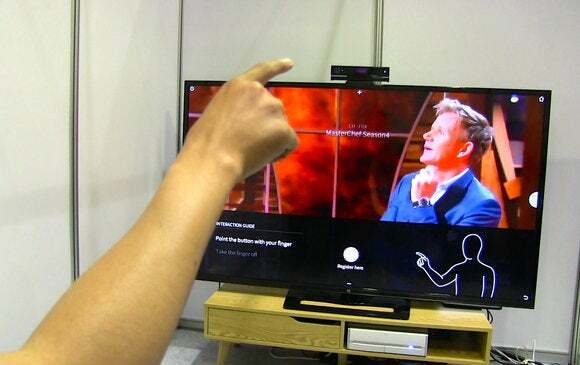 At the CHI 2015 conference in Seoul, formally titled Human Factors in Computing Systems, Vtouch is demoing a Kinect-based gesture system that can also control household lights, stereos and thermostats with a single 3D camera. Users sit several meters from a large-screen TV and undergo a quick calibration by pointing at a circle on the display. Then it’s simply a question of pointing or swiping in midair to choose or scroll through menu options on the system, which is also called Vtouch. Users can play video, channel surf or try video games such as darts. Where it gets interesting is pointing to objects that aren’t on the TV. Indicating a connected stereo or a lamp in the corner, for instance, will turn it on or off. Pointing at a thermostat or photo frame on the wall will call up an air conditioning or picture gallery app on the TV screen. In one demo video on YouTube, the system is used to “throw” content from one TV screen onto another several meters away. The Kinect tracks the user’s eyes and index finger, which are almost always aligned, allowing for precise gestural input, according to the company. “This is not Kinect-dependent. We can use any other 3D sensor on the market,” said Nathan Kim, COO of Vtouch. The technology has been in development for several years, and the company is working on embedding the gestural-processing software, currently handled by a PC, into a compact motion sensor unit. It has yet to announce a timeline for commercialization but hopes to apply the technology for digital signage in public spaces such as shops and movie theaters as well as in the household.